Article for Ministers: Living on the Edge of Disaster. Any time Satan can get us to believe that our situation is unique, then he can dismantle us within our self- imposed state of isolation. 3. A Lack of Vision. The third symptom of spiritual emptiness is a lack of vision. This lack of vision will affect two areas of our lives. The first area deals with the sense of our own life's purpose. Vision brings a sense of purpose that will always provide direction for our lives. Without it, we become slaves to circumstances and the opinions of men. The second area relates to our personal relationship with Jesus. The neglect of this relationship causes our vision of who and what we are in Him to lack the clarity and conviction necessary for us to make decisions that guard our integrity. As Proverbs 29:18 says, "Where there is no vision, the people cast off restraint, but happy is he who keeps the law." The end result of a poor relationship with Christ is what I refer to as a "conflict of values." Just as our vision serves as a compass, giving our lives clear direction, our values serve a similar purpose. Are you running on empty? Perhaps you're not there yet - but you know you are getting dangerously close. Don't be afraid to confess and get help. There are a number of reasons why a church may decline and confront the prospect of ministry death. Some of the causes are outside the congregation’s control. Others are a direct result of what the people are doing (or not doing) within the church. Listed are reasons why churches close. The wise leader will recognize where his congregation is and prevent the loss of a church. Loss of population base within the community. A significant factor confronting many churches located in isolated rural areas is the decline within the community at large. As the children become adults, there are not enough economic bases to support them. As the population of the community decreases so do the opportunities for the church outreach and growth. New people, having no ties to the community, may travel to a larger metropolitan area to attend a church that has multiple programs. Demographic change within a community. Demographic changes alter the cultural setting of the community. Churches that do not adapt to these changes can find it difficult to minister to the new cultural setting. Because small churches tend to be homogeneous, they are often the last to change when transitions occur in the demographic setting. Unwilling to change, they soon become isolated from the mainstream of the community. Changes in society. There are several changes within society that have significantly impacted the small church and contributed to the decline of some congregations. In the past, the church was a social center of not only the people who attended, but also the whole community. People came to church to see their neighbors and friends. No longer is the church this social center; instead people have multiple social centers, which draw them away from the church. Consequently the church no longer has the influence within the community it once had. The downside of this is that people no longer attend church for social interaction, making it more difficult to attract new people. Another factor has been the mobility of people. People will drive past many churches to attend the church of their choice. No longer is there the true “community church” where everyone in the community attends because it is the only church available. Now, because distance is no longer an issue, people have multiple choices of which church to attend. A third change in society is consumerism. Previously people attended a church because of their loyalty to the congregation and community. Even if the church was not “ministering to their needs” they remained because of their sense of duty. Now people hop from church to church depending on their particular needs and availability of programs within the church to minister to those needs. Every sermon needs an introduction. A good introduction will make or break your sermon. My homiletics teacher always said it this way, "Start a fire, then build a bridge." Tell your listeners what you intend to preach about. Set the mood, tone, and atmosphere of the sermon. Grab the congregation’s attention and make them eager to hear more. Catch the basics of the sermon without giving anything away. Give the listeners a sense of tension and create anticipation. Apologize for the content or nature of the sermon. Mislead people on the topic of the sermon. Be long and wordy. A long and wordy intro will quickly lose the interest of your listeners. I doubt there has ever been a day or society more dysfunctional than the one we are living in today. Children are growing up in homes with absent and all too often abusive fathers and mothers. These children grow up in an emotionally or physically abusive atmosphere. One recent statistic stated that 1/3 of the homes in America are verbally abusive homes. Where husbands stop short of hitting their wives, but instead wound them with words that cut deep into her heart and emotional make up. Many husbands are grown men with childhood scars that leave them wounded little boys for the rest of their lives. These same men are often emotionally unable to minister to the sensitive needs of their own children and thus a new generation of dysfunctional adults are born. The individual is wounded, emotionally scarred and hurting spiritually. There is in America a vacuum of need in the individual's life. It may well be said that there has never been a time when this vacuum has been greater. We have a Savior who can answer the needs of the individual, yet with this wonderful touch of God on our lives, we are all too often unable to transfer God's loving touch to the hurting, needy individual. Where is the catalyst that will bring Christ to this hurting world? The catalyst is the Church, yet the catalyst is sometimes unable to accomplish her part. We have to ask ourselves, why? The disciples tried their best to shut Blind Bartimaeus up. They were so inebriated with their own relationship with Jesus that they almost angrily tried to shoo Bartimaeus away. Never noticing his need, they said, "Leave the Master alone". The individual in America is an emotional mess, with wounds and scars that alcohol, drugs and psychologists cannot heal. The Church is this person's only hope. However, in the traditional church setting, the individual is not always wholly ministered to. Many people have needs that cannot be completely met in the traditional church service. If a silent poll were taken in the average church, I believe we would be surprised to hear what some people would say concerning their personal, spiritual and emotional needs being met. In the Home Friendship Group setting, the individual has an opportunity to not only be ministered to, but to minister to others. The Bible does tell us to "edify one another". A true family unit is developed when adult members share in the responsibility of preparing food for fellowship times, praying & worshiping together, caring for the children of the group, and hosting meetings in one another's homes. 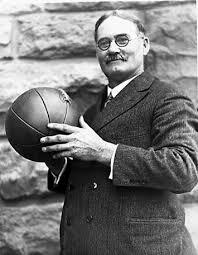 Dr. James Naismith was born in 1861 in Ramsay Township, Ontario, Canada. Naismith’s parents died of typhoid when he was only 9-years-old leaving him to live with his strict religious grandmother and uncle. In 1883, Naismith entered McGill University in Quebec. Initially, he stayed away from sports until friends suggested he join football rugby and lacrosse to stay fit. He graduated top 10 in his class earning a Bachelor of Arts degree in philosophy and Hebrew. Naismith won scholarships in theology and continued to participate in sports, much to the dismay of his professors. They particularly didn’t like lacrosse due to its aggressive nature. Yet Naismith held to his belief that a person could play sports and have a good spiritual life. After obtaining his diploma and becoming an ordained minister, Naismith departed for Massachusetts and joined the YMCA in the summer of 1890. While teaching youth physical education, he discovered that football, baseball, and track and field were great in the summer months, but there was nothing in the winter months to keep the young boys busy and off the streets at night.